UD Naked Heat vs. ABH Modern Renaissance - Which to Choose? The question of UD Naked Heat vs. ABH Modern Renaissance has come up a lot this past week! The Urban Decay Naked Heat palette was available for pre-order on the Urban Decay website yesterday and will be available soon to buy at other retailers. The Anastasia Beverly Hills Modern Renaissance palette has been available for over a year. The UD Naked Heat palette is made up of peach, copper, terra cotta and brown shades. The ABH Modern Renaissance has cream, pink, red, terra cotta and brown shades. Both palettes have a lot of warm tones. The ABH Modern Renaissance offers more versatility and variety with its reds and pinks. There are no shades like Buon Fresco (dusty mauve), Vermeer (pale metallic peach-pink), Primavera (pale metallic peach-gold), Love Letter (dark cool red matte) or Venetian Red (dark warm red matte) in the UD Naked Heat palette. Buon Fresco has become a go-to transition / crease shade for me. I love it so much I bought a single. The UD Naked Heat palette doubles down on some gorgeous warm shimmers like Lumbre (copper shimmer with gold pearl), Scorched (metallic deep red with gold shimmer), and Dirty Talk (metallic burnt red). I personally feel that Dirty Talk and Scorched are very similar shades and I don’t know of a situation where I’d reach for Dirty Talk over Scorched. I would have liked to see Ashes as a true burgundy wine matte, En Fuego as a true burgundy red matte, and He Devil with slightly more red in it. Many of the shades end up looking similar on the skin, though that’s the case with the Naked Palettes. I also think it would have been interesting to see Low Blow as a mustard yellow matte, which would work well with these colors. Golden Ocre and Sauced, Tempera and Ounce, Realgar and He Devil, Cyprus Umber and Ashes, Antique Bronze and Ember, Red Ochre and Cayenne. These aren’t exact matches, but they are similar. Now on to the size. You get a VERY small amount of product in the ABH Modern Renaissance palette. You’re getting 14 eyeshadows that are .02 oz each for $42. The UD Naked Heat palette is 12 eyeshadows that are .05 oz each for $54. This makes the Naked Heat palette the clear winner when we’re talking value for the price. Do you need both palettes? If you wear warm neutrals all the time, then yes! If you rarely wear warm neutrals, you only need one of these. If you’re afraid of color, skip the Modern Renaissance palette. You’ll be happier with the tones of the UD Naked Heat. If you want to dip your toes into color, the Modern Renaissance may be your pick. 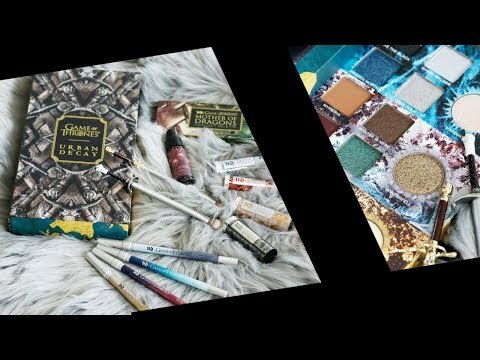 Check out my Anastasia Beverly Hills Modern Renaissance palette review or my Urban Decay Naked Heat Collection First Impressions video for more! These tutorials and looks can be recreated with the UD Naked Heat or the ABH Modern Renaissance palettes. Next articleWhat was your last impulse buy? Great analyses, very colorwise. I am more concerned about the quality of the shadows in Urban Decay Heat palette. I own the other Naked palettes, but their quality is well bellow ABH shadows or Modern Renaissance… They all mix into a stain, I find it very difficult to get the look I get with ABH shadows, even using the Urban Decay primer. The Urban Decay shadows seem to lack the pigmentation and the durability of the ABH shadows. Does anyone feel the same? Wow – these two palettes really do have a lot in common – although Heat has more orangey shades and a couple look very similar to each other. I feel as if Heat needed at least one or two darker shades (and NOT matte black either!) for contrast. If I had the ABH palette, I don’t think I would bother with Heat for the reasons above. ABH Modern Renaissance offers a more versatility with its shades. Thanks for this! This exact question has been on my mind. Do you also feel there are any differences in quality? Ease of application, blendability, wear time, pigmentation, etc.? I know your preferences may differ from mine, but if you lost both and could only repurchase one, which would you get? Tough question! If you’re someone who loves to wear red, you really need the Modern Renaissance because of the 2 reds and Buon Fresco. If you look great in peach & terracotta, you need the Naked Heat. I like both formulas and both wear well for me. Thanks for comparing these! I have ABH MR, but I intend on getting Naked Heat at some point. I think it’s enough different. Thanks for giving us this info. I have purchased both of them, but hope to use the ud naked heat with two colors I already have. I can’t wait for it to arrive and to blend it with both the Basquiat Not for Sale and the Ultimate Basics Extra Bitter! I think they will all work together nicely. I purchased the Anastasia palette, but haven’t used it yet…it scares me. But I’m thinking I will be braver in the fall. Can’t wait to see the lipsticks and liners too. In the meantime, do you have any suggestions for ud liners that will complement this palette? Mine arrives tomorrow. I’m still umming and ahh-ing over this. The UD swatches look wonderful here (much better than the first ones UD posted), and I have found some Colourpop dupes of the most unusual shades in Modern Renaissance. Thank you so much for doing this swatch comparison..Btw your eye look with Naked Heat is stunning! So I personally don’t have ABH Modern Renaissance, and I’m so glad you did this analysis! 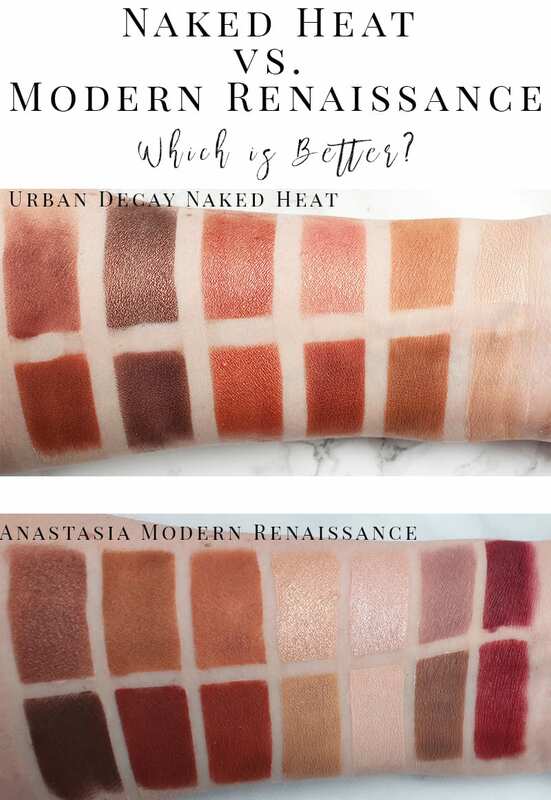 I now would probably go with ABH, even though Naked Heat is beautiful and I definitely do love warm rich tones but seeing as I do really love dipping my toe into impactful color, and I am looking for those true burgundy wines for sure. I really love the other transition shades like Buon Fresco that you mentioned. Also, I just purchased the Natasha Denona Sunset Palette(which I really recommend if any of you love a rich shade profile with amazing textured shades-remind me to swatch it for everyone in the group..), so I think that because of that I would say for sure I don’t need both, and so I really think MR compliment ND Sunset, and I love the Renaissance period (historically, artwise too and it really is reminiscent?) But I’m glad that they did Naked Heat and I have it in mind to gift to my cousin in Lebanon/Dubai since I bought her Naked Smoky, she loved it and she doesn’t have these shades ?